Product information "Haibike SDURO Fullnine 3.0 black/gray/white men 2019"
The SDURO Fullnine is equipped with 29 inch wheels. These guarantee manoeuvrable and agile handling in the terrain and on trails. Root passages are no longer a problem thanks to the 29 inch wheels. The 100 mm fork and the 180 mm disc brakes provide the necessary safety. The damper increases the traction on root passages and thus simplifies the ride in difficult terrain. The exit is much more relaxed and the driving pleasure increases enormously! With the 10-speed gear you always have the right gear for every terrain. So you're not too steep! This is also ensured by the powerful Yamaha PW-SE with 250 W. The 500Wh battery ensures that you can handle long trips without any problems. Thus, the SDURO Fullseven is the perfect choice for longer off-road tours! 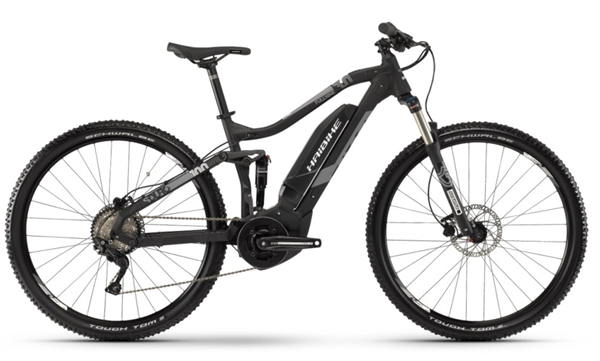 Related links to "Haibike SDURO Fullnine 3.0 black/gray/white men 2019"
Customer evaluation for "Haibike SDURO Fullnine 3.0 black/gray/white men 2019"